Come and celebrate Women's History Month on March 11, 2010 at the Latino Museum of History, Art and Culture (514 South Spring Street) at 6:30 p.m. Pieces from the Museum's Permanent Collection by Latina artists will be featured at the event. 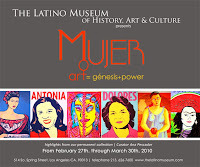 Admission is free, but please RSVP by calling 213-626-7600 or emailing events@thelatinomuseum.com.